Seating solutions for training rooms, meeting areas, conference rooms, and cafes. Robust and durable, the Arena collection is perfect suited to conference rooms, meetings areas and wide range of general office applications. You can choose your Arena chair with either the 4-leg or cantilever frame, and even add an writing platform. Let us quote you ! Call us now on 020 7536 2310 or email sales@omm.co.uk for a FREE, No Obligation quotation on all your training room and conference room needs. 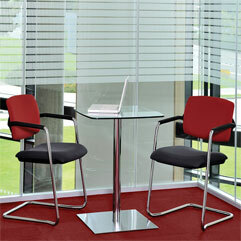 Mirage-2 offers your office a distinctive design without compromising on comfort. 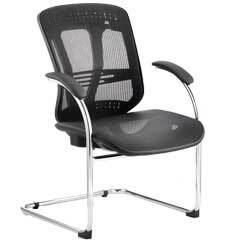 The back features a breathable mesh while the contoured seat and back provides additional support. The Mirage-2 is available with or without a headrest. The Alina range of seating has been created specifically for training rooms, meetings rooms and conferences. 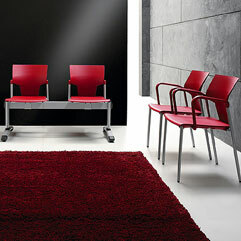 Available in 3 different frame styles - cantilever, 4-leg, and with armrests - Alina features a striking red and black upholstery and chrome frame. Alina is a spacesaver too, capable of being stacked up to 5-high. Boasting a streamlined profile and contemporary shape, the IKON range of training and conference seating is guaranteed to enhance any public space. 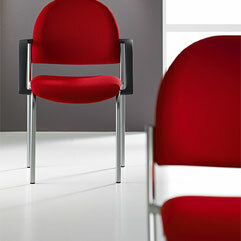 Not just good-looking, IKON is a practical choice, offering ergonomic comfort to the user. Whether you host regular meetings or conferences, or just have the occasional one-off, we can provide you with training, meeting and conference seating at a price to suit you. With OMM, you can buy, rent or lease, depending on your needs.